Austrian physician; born at Prossnitz, Moravia, in 1831; died at Olmütz April 13, 1894. He was the son of the physician Gideon Brecher. Adolph Brecher, after attending the gymnasia at Presburg and Prague, studied in Nikolsburg and at the University of Prague, where he devoted himself first to Jewish studies, then to the study of medicine. In 1859 he took up his residence at Olmütz, and practised as a physician there until his death. Brecher was popular and respected as a general practitioner and as a consummate master of diagnosis. He was physician for all railroads with terminals at Olmütz. Moreover, he took an active and useful part in the public affairs of the city, serving for twenty years as director of the German Association (Deutscher Verein), and sharing in the management of the musical society. The Jewish community at Olmütz chose him as their vice-presidentfor more than a quarter of a century, and the Jewish community at Prossnitz made him an honorary member in recognition of his many services. Brecher had a noble and richly endowed temperament; he was a clear thinker, a brilliant speaker, and a sympathetic poet full of sparkling humor and deep earnestness. He spoke and wrote in several languages, and developed a prolific and many-sided literary activity. Among his publications are: a book of riddles, "Sphynx," signed "A. B. "; and later some collections of humorous poems, of which the following met with greatest favor: "Bunter Kram"; "In Müssigen Stunden," Berlin, 1890; and "Im Schaukelstuhle," Berlin, 1891. He contributed largely to the "Fliegende Blätter" of Munich. In his later years he was permanent collaborator of "Humoristische Deutschland," edited by Julius Stettenheim; "Berliner Wespen," edited by the same; and "An der Blauen Donau," Vienna. In addition to his contribution of poems to these three publications he made a number of translations into German. 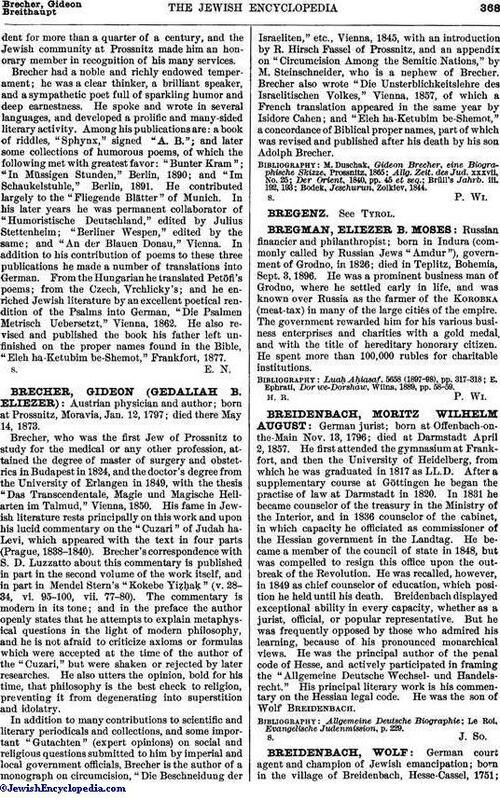 From the Hungarian he translated Petöfi's poems; from the Czech, Vrchlicky's; and he enriched Jewish literature by an excellent poetical rendition of the Psalms into German, "Die Psalmen Metrisch Uebersetzt," Vienna, 1862. 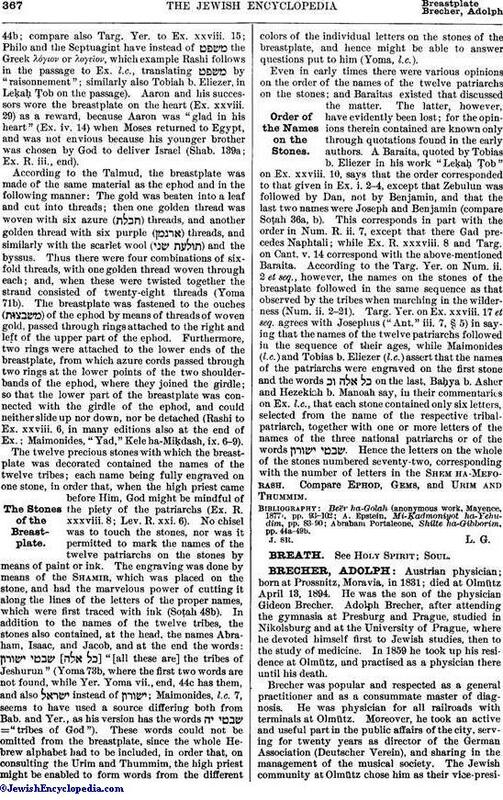 He also revised and published the book his father left unfinished on the proper names found in the Bible, "Eleh ha-Ketubim be-Shemot," Frankfort, 1877.